Happy December everyone! It’s been a busy month at Kernl. We’ve got a few great new features completed, some infrastructure updates, and a few bug fixes. Let’s get started. Customer Management – With the release of our new License Management product we introduced the concept of “customers”. As one would expect, a customer is someone who you assign a license to. The reason we introduced this was so that you could have multiple licenses associated to a single person and easily manage those from a single place. This is a huge improvement over the previous iteration and I highly recommend that you check it out. Hop over to the “License Management’ page and then click “Manage Customers”. Customer Management API – In addition to the new customer management area in the app you can now access the customer management API. There are a lot of different ways that people purchase your plugins and themes so exposing a rich API is the best way to allow integration with Kernl. If you’d like to learn more, check out the documentation. Purchase Code Migration – If you are a user of the legacy “purchase code” system you can now migrate all of your existing purchase codes over to the new license management system. When you go to the license management page there is a big call-out at the top when you can migrate your purchase codes. If you do this, make sure to update your plugin_update_check or theme_update_check file and where you instantiate the Kernl update class. Documentation for using the new license management system can be found here. License Domain Restrictions – You can now restrict updates that are secured by license management to specific domains. The web app has been upgraded from Angular 1.3.x to Angular 1.6.6. This is one of the first steps in a migration path forward to the next generation of Angular and a web app UI refresh. You are now able to refresh the Git repository list that Kernl has with the press of a button. Before you had to disconnect/re-connect the integration. In the interest of moving quickly, the first pass of license management and customer management did not have any tests written for it. This month we added a suite of tests around both APIs so that they remain stable. Our back end application servers have been upgraded to Node.js 8.9.1. This brings security updates as well as new language features. The license management documentation was updated to include links to the WordPress Settings API documentation. Kernl doesn’t make any assumptions about how your plugin or theme is developed, but people often ask what the easiest way to get licenses into their app is. The WordPress Settings API is likely the easiest, so it’s now mentioned in the documentation. Meta tags have been added to the marketing site so that shares to Twitter look richer. There was a bug in feature flags where individually targeted flags did not toggle on/off correctly. All packages on all servers have been updated with the latest security fixes. That’s all for this month! Have a great holiday season everyone! If you’ve ever created a plugin for WordPress and wanted to sell it you’ve likely run in to the problem of delivering updates to your customers. Agencies and internal developers run in to this problem as well. You can’t upload your plugin to the WordPress.org repository because then it will be free for everyone, but you still really want integrated update functionality. Kernl.us is a SaaS product that helps solve this problem (and so many others!). 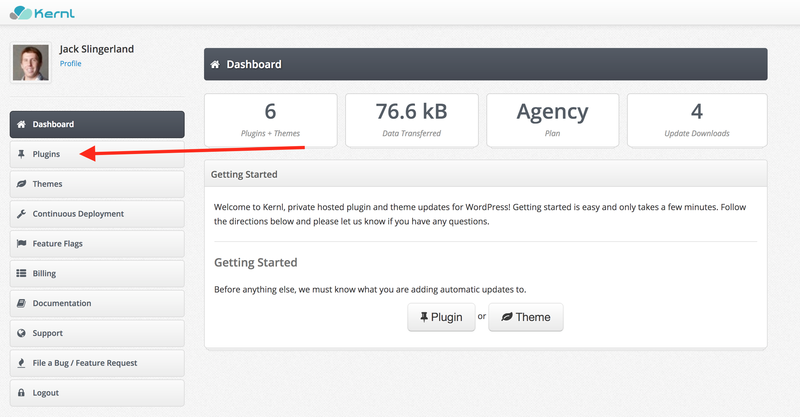 Kernl allows you to distribute updates to your premium plugin automatically using the built-in WordPress update functionality. So how does it work? Add 2 lines of code to your plugin. Lets dive in an see how this works! After you’ve signed up for Kernl, the first step to configure seamless automatic updates is to create a plugin entry in Kernl. To do so, click the “Plugins” button in the left-hand menu. Next, click the “Add Plugin” button. The next step is easy. Just enter the name, slug, and description of your plugin then press “Save”. Now that you have a plugin entry in Kernl, you can add the Kernl update code to your plugin. Download the Kernl plugin update code from https://kernl.us/static/php/plugin_update_check.php. and place it in the root directory of your plugin. Next, take note of the UUID of the plugin that you just created. Replace “MyUuidFromKernl” with the UUID of the plugin you just created. Now that you have Kernl inside of your plugin you need to zip it up. At the folder level, go ahead and zip the plugin using the zip tool of your choice. Take your plugin and click “Add Version” inside Kernl. Next enter the version number (of the format MAJOR.MINOR.PATCH, ex 1.4.14), select the zip file you just created, and press “Save”. Now that Kernl has this version of your plugin, feel free to distribute this ZIP file to your customers. If you ever need to release an update, just make your code changes, zip them up, and upload the new version to Kernl. Within 30 seconds the update will be visible to your customers at which point they can download it!